Hello I am Lee and I am a member of catch and release team. First a little bit about me I have been fishing ever since I was five that’s 21 years now! 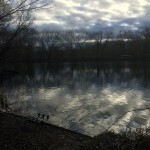 (easy Math for my age) I have been a member of a local angling society all these years as well as fishing many other waters around the surrounding areas. 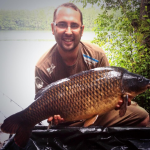 My personal best is a 31lb4 mirror carp that caught two years ago my personal best for common carp is 26lb. I know these are not massive weights but I personally love to catch quality i.e lips not ripped to shreds and sore spots on the fish. Obviously if I caught a 35lb immaculate common carp I would be kissing every angler on the bank!!! In my articles I aim to record all my fishing trips and chat about different things I am trying and thinking about trying. Also I hope to put across my views on many topics that carp fishing has. As mentioned in previous blogs I have been fishing since I was five. But before my dad let me loose on his prize carp fishing outfit he told me I had to learn to fish properly i spent many a day on the side of the bank with my daiwa cork handled float and quiver rod. Sitting on my hands as any slight movement of the float the adrenaline would get the better of me and I would hear my dad say from the next swim up “patience grasshopper”. I remember first using a keepnet I was catching a range of silver fish all throughout the day and come evening it was time to haul in the days catch. I could not believe the amount of fish I had. I had a photo taken with my prized catch then watched the silver flashes dart into the water as my dad released them back into the lake. A few years past going fishing with dad some very good sessions on the various lakes and stretches of river all the time I was waiting for that day, the day i could use the rods that were sat on the rod pod all quietly minding there own business until they decided that they wanted to make the noise that increases the heart rate of any carp angler. I don’t think I have ever lost that adrenaline buzz that I got when I first heard my dads bite alarms screaming at him. That adrenaline I would later find out could almost cost me my first prized fish. It was mid year just a normal school morning mum had come in probably for the fourth time by now telling me to get up so finally I got myself out of bed and started to get ready for school. I heard my mum call for my dad and by the tone of her voice I could sense something was wrong. With my uniform now on ready for breakfast I trudge down stairs to see my mum and dad standing outside in the back garden. “It’s all gone” I heard. Someone or should I say some *#*#* (I will let you decide what word to put in there!) during the night had broken into all of our sheds and the fishing gear had gone along with many other items including both mine and my brothers bikes. To this day I can remember the feeling of disbelief and waiting for my mum and dad to say surprise we have actually bought a whole lot of new fishing gear and a gleaming new bike but it wasn’t to be. After a couple of months of no fishing and following along behind my dad at many boot fairs looking for any of our stolen items for sale I came home from school to what seemed a fishing tackle shop in our front room. Brand new everything including a new float rod, reel and my own tackle box. I had made it now in my eyes my own tackle box that I could put the various floats, hooks and split shot my dad had bought for me. Like getting a new bike at Christmas I wanted to go there and then to use my new gear. After a few sessions with the new gear the day came that I had been waiting for over the years. Dad said to me the left rod on his brand new pod was mine for the session. The waiting was over it was now my chance to listen out for that high pitched beep and actually use some of that adrenaline that engulfed my body each time. Dad has said to me, during the years after my early fishing days, that he would get comments from other anglers such as “how do you get your lad to sit so quietly and patiently fishing? If I brought my young child they would be bored in an instant and running around everywhere!”In reply he would say jokingly “he knows that if he ran around and made noise he would get a good clip round the ear!!”. I was just so involved in waiting for the next fish watching the float slightly twitch dad would say to me when the float would move but not go straight under that they were the “dinner bells”calling the fish to feed. But today was different I couldn’t concentrate on my float fishing my mind was else where dreaming of that (as I mention in my post“Sunday morning ritual”) lottery winning carp. A good few hours had past then that distinct sound of the bait runner slowly ticking round then all hell breaks lose. The bite alarm that has been sitting like me quietly with the odd beep just to let me know it is still there but really sitting there all day on edge ready to scream at me. I’m out of my chair like a rocket over to my rod that line is being stripped at a rate of knots by the unexpected fish that picked up my hook bait. I pick up the rod I strike into the fish as doing so the adrenaline in my body acting like nitrous oxide in a car, but it doesn’t feel right I look down and see the biggest birds nest from the reel to the first ring. I had forgotten the most crucial thing that my dad had clearly told me about on numerous occasions “lee don’t forget to wind the reel before you strike” but I had forgotten so I did as always and still in some cases even today say the two words “dad help!”. The fish was still on but it was pulling the many loops of line tighter against themselves. I handed the rod to my dad standing behind him head down thinking that’s it I have messed my chances up now the odds for offer of the left hand rod are now slim. Then suddenly the rod was passed back to me and to my amazement the birds nest was no more, well I say no more all my dad could do in the situation was to wrap the numerous knots around the spool. With the drag on its tightest setting as I was unable to give any line. I slowly started to reel in my first carp with directions from my dad to keep the rod tip up don’t let the line slacken off. In a instant the carp turned on its side head out the water and with that into the net. I had done it caught my first carp a 15lb mirror with a bit of help from my dad! I have never forgotten that day and more importantly I have never forgotten to disengage the bait runner before striking! So that’s where my love of carp fishing started. I suppose if you could take a moral from my experience it would as a parent if you have told your child something 100 times make sure you tell them 101 times because that one more time of saying they might just remember it!!!!!! Please keep reading my blogs and follow me on twitter @leescarpblogs comments good or bad welcome also keep an eye on twitter as I have had some good news regarding my blogs. 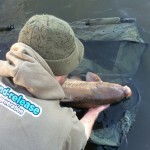 YEAR TO DATE – LEE SLATER Join lee as he takes us through a few of his recent captures and a few venues he’s hit this year.